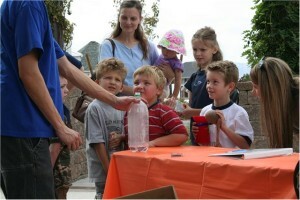 That’s all the more reason, he adds, for families to head out Saturday, May 21, for the Central Utah Water Conservancy District’s free Water Festival, held from 10 a.m. to 2 p.m. at the gardens, 355 W. University Parkway in Orem. The first 500 people through the gate get a free superhero cape, playing on a theme that runs throughout the day. Once inside, there will be superhero games to play, presentations to catch in the amphitheater and hot dogs and popcorn. All events and snacks are free. Also check out the Water Safety Fair featuring a Utah Lake patrol boat, lifeguards and more, organized by a local Eagle Scout as his community project. “He has a lot of things planned—I think he’s even bringing a dunk tank—and if it goes well, we’ll keep bringing it back,” Finlinson says. There’s much more in the works to celebrate water “because that’s what we do,” Finlinson says. That enthusiasm will be evident throughout the gardens. Visitors will have the chance to fully experience what many take for granted. H2Joe, who visited the gardens earlier this year in search of crocuses, will be there, too. He’ll welcome visitors to one of his favorite places. And someone will go home with a Power Wheels Batman Dune Racer.